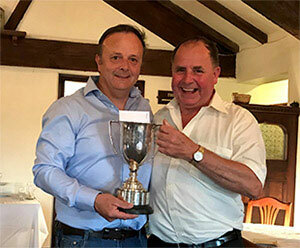 The Ormskirk and Bootle Group annual golf competition took place at Mossock Hall Golf Club. As in previous years the weather was superb, with 29oC degree temperatures, so not only was the weather hot but so was the competition when serious battle commenced on the course. The golf course was in fantastic condition, considering the very hot weather in the weeks leading up to the event and the staff at Mossock Hall are to be congratulated on their efforts in producing such superb conditions. Colin Higginson (left), the Masonic competition winner, being congratulated by Graham Chambers. This annual group event is open to all members and friends (Masonic and non-Masonic). In order to introduce Masonry to non-Masons a separate competition is held for them and they are always most welcome. A total of 36 players took part in the two competitions and 45 attended the presentation dinner in the evening. The main competition was won by Colin Higginson of Ormskirk Priory Chapter No 4007 with Harry Jones of Latham Lodge No 2229 being the runner up. Colin scored a very impressive 41 Stapleford points. The guest’s competition was won by Josh Kane on 31 points and Lewis Jones was the runner up. During the meal, guests were asked to support the raffle and auction for the nominated charity which was the Royal School for the Blind in Liverpool. The raffle and auction raised £900 and this was enhanced by a donation of £200 from Payment Shield Limited, making a total of £1,100 raised for this very worthy cause. 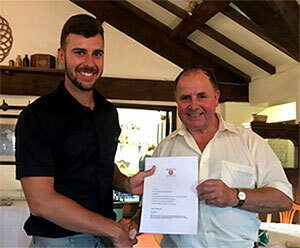 Josh Kane (left), the guests’ competition winner, being congratulated by Graham Chambers. Thanks must be given for prizes donated by Jim Carrie of Aughton Lodge No 7996 who donated Williams BMW golf brollies, towels and golf balls, Peter Kelly of Lathom Lodge, who donated a superb glass sculpture and coasters, the Mossock Hall Golf Club donated a round of golf for four persons, Ian Rooney from Arthur Stanley Lodge No 3469 donated a round of golf for four persons at Haydock Park Golf Club and further prizes were donated by Everton Football Club of a signed football and four sets of Anfield stadium tours tickets were gifted by Liverpool Football Club. The Ormskirk and Bootle Group Golf Representative, Gary Evans of Arthur Stanley Lodge, thanked all who attended for their support in taking part in the golf, attending the presentation dinner and their enthusiastic support of the raffle and auction. Gary also thanked the Ormskirk and Bootle Group Chairman Graham Chambers for his attendance at the presentation dinner and for presenting the prizes. In presenting the prizes, Graham congratulated the winners and runners up of both competitions. He went on to thank Gary for all his hard work to ensure that this special annual group event was a success. Gary has organised this event for a number of years and Graham congratulated him on his enthusiasm for the event which has led to a significant increase in the numbers taking part and which has also raised significant amounts for charity.